The application covers the main applicant, the spouse (husband or wife) and any children under 18. Older dependent children and parents can be included at a small extra fee. This means that you can guarantee a safe place of residency and easy travel not only for yourself but for your loved ones as well. 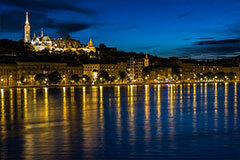 The Hungarian investment residency program is the cheapest state-guaranteed golden visa program in Europe. You do not have to visit Hungary to apply, nor is there a minimum stay requirement once you get the residency. There are no additional requirements like health check, country of origin restrictions, or proof of origin of funds. Once you transfer the investment amount, we start processing your paperwork immediately, and you can expect your residency card as early as in a month. Once you have residency in Hungary, you can travel into and within the Schengen zone without a visa for up to 90 days at a time. Since there is no minimum stay in Hungary, you can use this resident permit for visiting any European destination of your choice, for holidays or for business. Currently there is no expedited citizenship option for this program but after holding a PR for 5 years you do become eligible for citizenship and a passport. The Hungarian passport is highly valued because it allows you to travel visa-free to a number of locations, including the US and Canada (as well as Europe, of course). This program is 100% secure, as the investment serves to purchase a government bond that is guaranteed by the state of Hungary. There is no interest for the investor but there is also zero risk (unlike, for example, real estate investment). The investment is returned to you in full after 5 years.